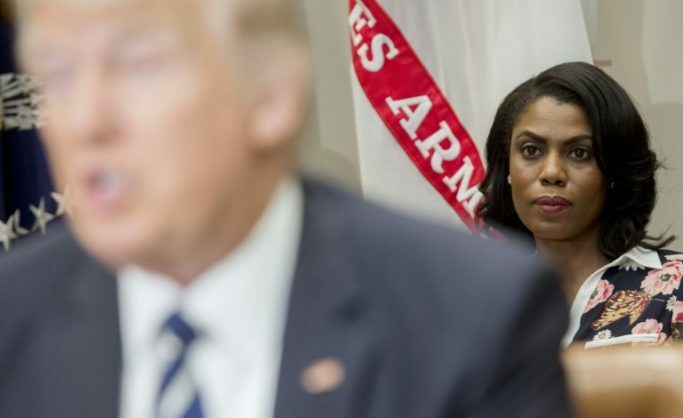 President Donald Trump (L) has already branded Omarosa Manigault Newman (R, in focus) a "lowlife" after she released a recording of her firing by chief of staff John Kelly | © AFP/File | Saul Loeb. Omarosa Manigault Newman — who first gained fame as a contestant on Trump’s reality show “The Apprentice,” and then secured a $180,000-a-year staff job at the White House — released a recording of a private conversation she had with the president after she was fired. “Wacky Omarosa, who got fired 3 times on the Apprentice, now got fired for the last time. She never made it, never will,” Trump said in a stream of angry tweets. The Republican president claimed that Manigault Newman “already has a fully signed Non-Disclosure Agreement!” — a first admission that members of the administration were asked to sign potentially illegal hush deals. Manigault Newman’s recordings have also caused political problems for Trump, dominating American headlines for days — and she told NBC that there are “absolutely” more audio files. The latest recording appears to show a president who has little knowledge of what is happening inside his own White House — or who is willing to lie to avoid confrontation. “Omarosa? Omarosa, what’s going on? I just saw on the news that you’re thinking about leaving? What happened?” he said, apparently unaware she had already been fired. Trump had already branded “Omarosa” — as she is commonly known in America — a “lowlife” after she released a recording of her firing by Kelly, seemingly recorded in the White House Situation Room. “She begged me for a job, tears in her eyes, I said Ok. People in the White House hated her. She was vicious, but not smart. I would rarely see her but heard really bad things,” Trump tweeted. Manigault Newman’s firing by White House chief of staff John Kelly — and her apparent audio taping of the encounter — is at the center of the political firestorm | © AFP/File | Olivier Douliery, Dominick Reuter. Manigault Newman later expressed willingness to cooperate with special counsel Robert Mueller, who is investigating Russian interference in the 2016 election and possible collusion between Trump’s campaign and Moscow — and indicated that she had already been contacted by his office. Trump came to office vowing to hire “only the best people” — but has struggled to put a lid on leaks, incompetence, backbiting and scandal inside his White House.